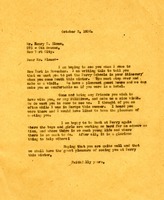 A letter to Mr. Curry expressing excitement for his visit to the Berry Schools. 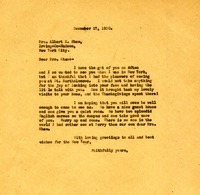 Berry sends a letter to Mrs. Shaw about when they met each other and what a great pleasure it was. Also she asks Mrs. Shaw to come up to the Berry schools and stay in the guest rooms, explaining that there are two English nurses on campus that can take care of Mrs. Shaw. 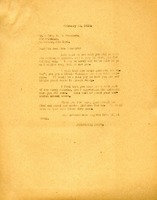 Martha Berry writes to Mr. Sloan and asks him to make a stop at Berry during the winter. She explains that they have a really nice guest house and she'd love for him to bring any friends or relatives with him. 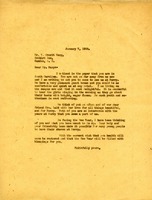 Martha writes to Mrs. Rea glad that she will visit the Berry Schools on her visit to Florida. Martha Berry thanks Mr. Pollocks for his timely gift. She says that he and his wife have been "such dear friends" to Berry over the years. Miss Berry expresses her pleasure at having seen the Pollocks and invites them to visit again. 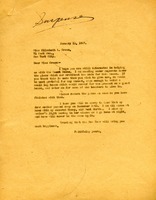 Martha Berry writes to Mr. Edwards telling him of the 34th anniversary of the Berry Schools, where a bust of her will be unveiled. She tells him that he could be picked up in Atlanta and could stay at one of the pleasant guest houses that Berry has to offer. 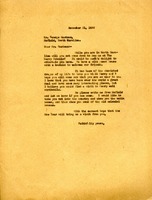 Extension of an invitation to visit Berry Schools to a Mr. George Eastman. He is invited to stay at the Berry guest house, which has "a hostess to welcome our friends." 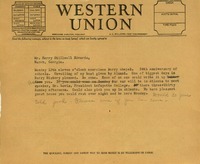 Berry offers to take him into the country and show him some cabin homes and old colonial houses. Martha Berry sends her thanks again for the furniture and lets Miss DeWolf know that literature has been sent to her. Martha Berry sends her thanks and hopes the couple will come to visit soon. Martha Berry thanks Mr. Crane for the gift he sent and expresses how much she wishes he would come visit. 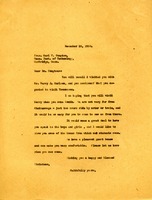 In this document, Martha Berry sends a letter to Karl T. Compton, President of Massachusetts Institute of Technology, in which she hopes that he will be able to visit Berry when he makes his trip south to Tennessee. She wants him to speak to the students and see the homes from which they come. 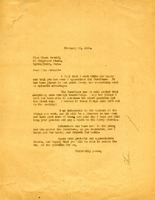 Flora C. White writes to request a response to her letter. 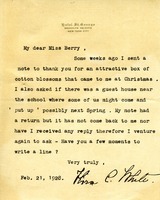 She wrote Miss Berry previously to thank her for the cotton blossoms and ask if there was a guest house at the schools in which she and her friend could stay in the spring. 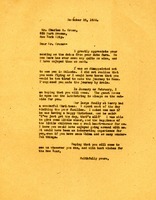 In this letter she requests a reply to her previous letter. An invitation to visit the schools while Mr. Macy is nearby in South Carolina. Miss Berry also speaks of how comfortable Mr. Macy could be in the guest house and about how much she enjoys living on campus and listening to the girls sing in the morning. She also speaks of their mutual friend Mrs. Ladd "with her love for all things beautiful, and for Berry." Martha Berry thanks Mrs. Elkins for a hospitable lunch and wishes to meet Mr. Elkins as she knew his mother. She extends an open invitation to visit Berry during their trip South and make use of the Berry guest house. 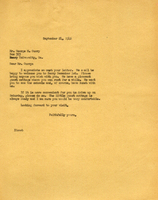 Letter requesting donations for the construction of a guest cottage and includes the plans made by the architect. Miss Berry says that even a simple log cabin would suffice for a guest house and later a house for teachers. She also tells Miss Green about her mother's death and how she is all alone with Aunt Martha.